Come and play on Singapore's only outdoor mini golf with 36 holes to test your skills. Mini golf is a wonderful way to introduce kids the exciting game and a great way to spend quality time with the whole family. 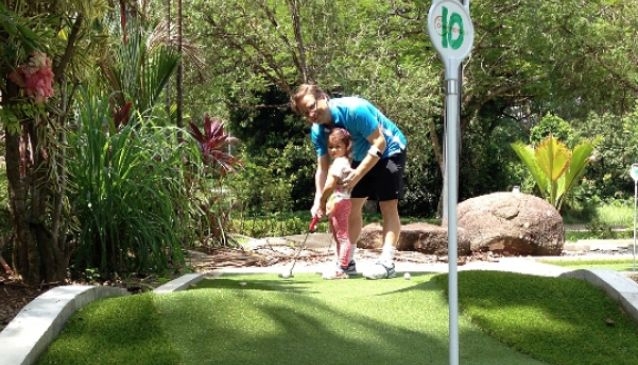 At Champions Mini Golf, enjoy the lush green gardens surrounded by the stunning nature of Bukit Timah. The place features two 18-hole courses: the Dragon Course and the Fruit Loop, which is slightly more challenging. Open the whole day, 7 days a week and 365 days a year, it is also also illuminated at night until 11pm. On weekends, when parents come down for a practice at the Champioins Golf Course you can come along with the kids who can be supervised. There's also some faciilities to have a drink, coffee, a quick bite at Picotin or a nice Thai meal at Royal Thai Cuisine. Admission Tickets: S$10 per person but group rates are available.